Vintage ceramic canister with a blue Made in Japan sticker. 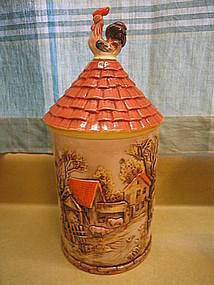 It is 11 1/2 inches in height (height includes lid) and 6 1/2 inches in width. It holds approximately 48 ounces. There are areas of loss of finish. Additional condition photos by email. Other sizes are available. I need your zip code to calculate the postage.